RAW: Tim & Ewa, tell us a little about your background. Where you are from, how did you meet and how long have you guys been together? Tim: After school I left the UK by myself to live in South Africa for a few years working as a game ranger. When I came back to the UK I joined the Royal Marines and after one long deployment I spent a few months traveling around Europe where I met Ewa at a dropzone in Spain. 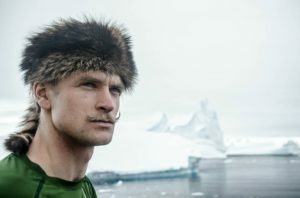 Ewa: Unlike Tim, whose life is adventurous as a whole, I lead quite a “normal” life. After university graduation from Aviation Management studies, I moved from Poland to Spain where could practice wingsuit flying as much as I wanted to – considering weather conditions allowing jumping season to last nearly the whole year round! For work, I manage projects for the airlines industry and spend my free time outdoors or flying. Professional life is important to me, as much as having fun and quality time after hours. RAW: Many people dream about flight. 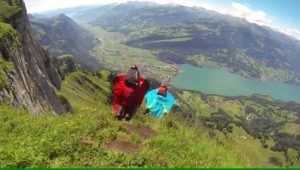 How did you each get into wingsuit and BASE and how does it feel to be able to share it with your significant other? 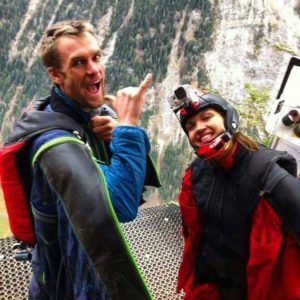 Tim: BASE was an obvious progression from skydiving for me and although Ewa is a lot more skilled wingsuit pilot than me we started wingsuit BASE at the same time, so it’s really nice to see each other’s progress. Ewa: …and it’s cool to be spending time doing things we both enjoy! Saves a lot of reasons for arguments ! 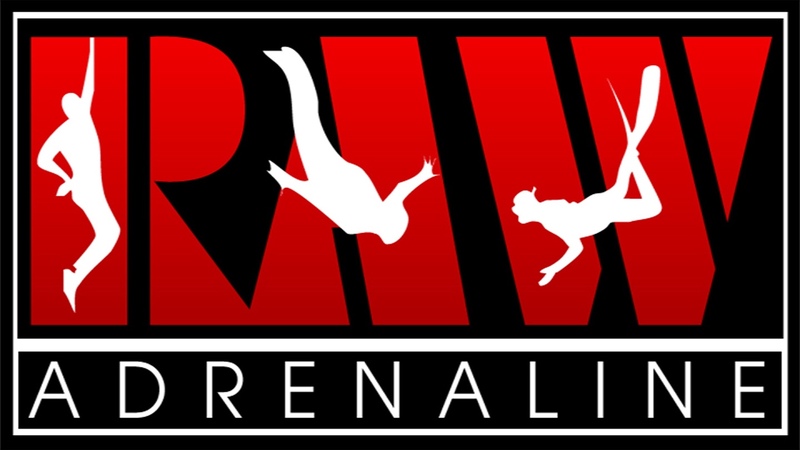 RAW: Although you are both highly skilled wingsuit BASE jumpers, what goes on inside when you watch your loved one jump off a cliff or push the envelope a little further? Do you egg each other on or do you keep each other level headed? Tim: Ewa keeps me in check for sure, I think we trust each other’s level and knowledge and we don’t take any unnecessary risks. There have been a few times we’ve scared each other though, although only briefly! Ewa: Tim is definitely the more daring one, but he trusts his skills and judgements, so I have to trust them too. Myself, I’m rather on “slower is faster” kind of approach…in terms of progression with ways of flying or places. RAW: They say a couple should never go to bed angry. Have you guys ever had argument at an exit point before jumping? Tim: Never! Not yet, I think we’ll walk down if we do. Ewa: We hardly ever argue anyways and exit point would probably be the last place to do so. 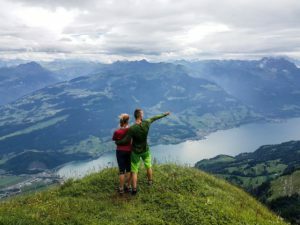 RAW: Tell us a little about the base and wingsuit community – is it common to find couples who do what you do in this field? Tim: There is nothing else like our community, I can travel anywhere in the world and find people to help me jump. Not too many couples but they do exist! RAW: What are your individual goals in your sport and what are your sporting goals as a couple? Tim: I can think of so many goals, but at the moment we are just steadily improving our skills together. 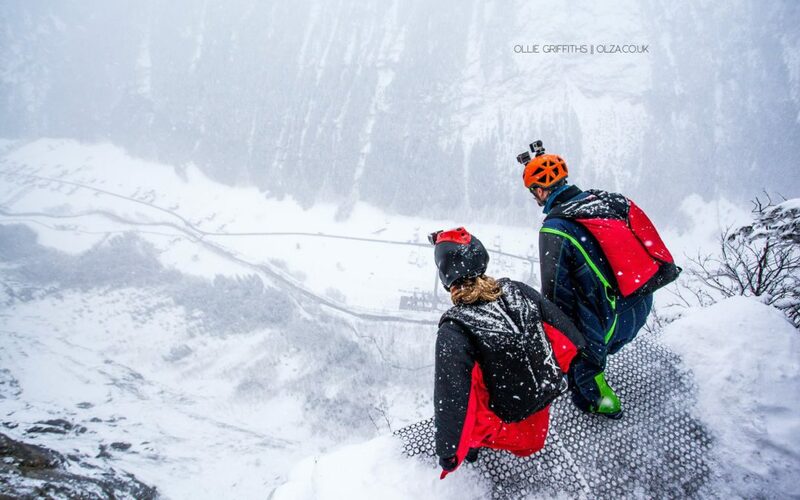 Our main goals are just to stay safe and keep on having fun in the mountains. RAW: You are both multifaceted individuals, tell us about the other sports you do and what inspires you about each. Do you do those together too? Tim: I took Ewa climbing for the first time the other day and was hugely impressed at how capable she was, sports like these definitely complement each other, mentally and physically. Ewa is also a good skier even after a 15 year hiatus she was getting down black runs no problem. 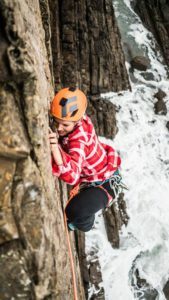 Ewa: ….I don’t have much of a choice, hanging out with Tim ends up, if not at the exit point, on black line skiing or climbing on the coast while tide comes in – on the “rest day” (laughs). He challenges me whenever he can and I love it, constantly discovering how colorful life is and how much we’re both capable of. RAW: You have had the opportunity to launch yourselves off some pretty awesome jump sites. Which is your favorite and why? Tim &Ewa: We ask each other this all the time to see if our minds have changed but we both still say it was a canyon jump in America, the jump itself was relatively short but the adventure surrounding it was awesome. River crossings, off road driving for hours and using a compass bearing to find the exit point. And afterwards, few hours to climb out of the canyon and walk through the desert back to the car. RAW: Your chosen sport is commonly regarded as one of the most dangerous activities out there. I’m sure you have both had a few scares along the way – what’s your sketchiest moment ever? 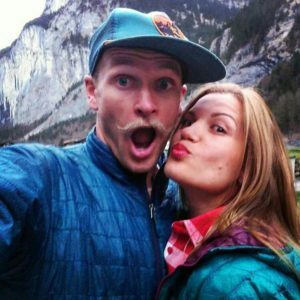 Tim &Ewa: There has been a few moments along the way, but we always learn from them and make sure it doesn’t happen again, pretty much every jump I do i learn something from it, even if it’s a tiny thing. RAW: Tim, Ewa, Much love to you both. We look forward to working with you and getting up to some epic adventures in the near future. Any last words of inspiration you would like to share with the world? Tim &Ewa: If you want something bad enough, you will find a way to get it done!